Bring your own lunch 11:00a.m to noon. 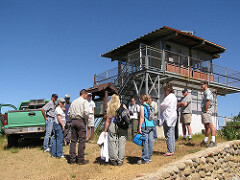 The open house event at Hi Mountain Lookout formally begins at 12 noon, with introductions, condor program updates, lookout tours, and guided field trips. In the evening there will be a potluck dinner, evening program presentations, star gazing, and an optional overnight campout. Visitors will find parking available close to the lookout throughout the day. Attendees are responsible for their own transportation. Note: high clearance vehicles such as trucks and vehicles with 4-wheel drive are highly recommended for the unpaved 6 mile drive from Pozo to Hi Mountain – there are stretches of rough road conditions along the way! Hi Mountain Lookout (elev. 3,199 ft.), Santa Lucia Mountains, Los Padres National Forest Meet 10:00 am at Hi Mountain Lookout. Emphasis will be on identification of resident and migrant songbirds and raptors in flight, and birding by ear (what’s that sound?). Habitats: oak woodland & chaparral Field trip leader: Steve Schubert, Morro Coast Audubon Society Easy walking conditions, about ½ mile along the lookout road. Gas stove and oven in the lookout facilities are available for cooking and heating food. Participants are encouraged to bring a potluck dish to share with their friends and guests. Partake of Jim Duff’s famous pineapple upside down cake for dessert, an annual tradition! Note: no open campfires, camping or backpacking stoves are permitted for cooking dinner or during the overnight campout. Camping sites are available Saturday night at ‘Cypress Hill’ near the lookout or at the USFS Hi Mountain Campground one mile down the road. Bring your own potable water. No open campfires, camping or backpacking stoves permitted – extreme fire hazard! and view the photo album of past open house events. Join is in our 15th consecutive year open house event!